For this month's "Maps Of The Month" featurette, I wish to draw your attention to Jester's Fantastic Dizzy (Genesis) maps. Fantastic Dizzy is the seventh main game (of eight) in the quirky European puzzlish platformer series featuring Dizzy, an anthropomorphic egg. This time around, Dizzy must rescue his girlfriend Daisy from the evil Wizard Zaks, who resides in a castle in the clouds. Along the way, he also helps out the other Yolkfolk and undoes the trouble Zaks has caused. Like other Dizzy games, Fantastic Dizzy is sort of a cross between a platformer and a graphic adventure game, in the sense that there is a lot of jumping involved, but also finding items to be used in other places to progress. Being one of the latest games in the series, it is one of the more advanced, now with smooth scrolling between screens, the inclusion of a few mini-games, and of course colourful and vivid 16-bit graphics. Fun and pretty as it is, it's still a hard game. It really goes without saying that a full map is a good thing to have in your arsenal. But not only did Jester provide that for VGMaps.com, but he also labeled all the important items that Dizzy will need to succeed in his quest. If the full world map is too much to take in, the fourteen individual area maps might be easier to use. Either way, they'll be handy as you go from Yolkfolk Village to Keldor Town to Zaks' Castle in the clouds. 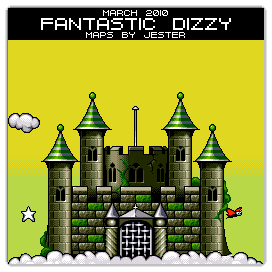 So to recognize the effort put into making these fantastic maps, Jester's Fantastic Dizzy maps will be known as VGMaps.com's Maps Of The Month for March 2010. Certainly a nice job, as far as I can tell. Congrats! I chose this even before I started thinking about how to fit in seasonally. I found a leprechaun, but then it was kind of in a boring area so I couldn't make a good thumbnail shot of it. Then much later I realized Dizzy is an egg (of sorts), but then I also remembered Easter is in April this year. But whatever. It's nice to connect things to the month or season if possible, but good maps are just as good any time of the year. Wow, this is some nice work! I was starting to make maps of my own for the Nintendo Entertainment System version, "The Fantastic Adventures of Dizzy", just last month. Actually, it's going to be two complete map sets, because the NES game was re-released a couple of times with many major changes. Thus I'm going to map every area twice so that it becomes clearer what all the changes in terrain and object locations were and they can help anyone who has either version. Even the later versions of the NES game have a lot of differences from the "Fantastic Dizzy" released on other consoles, so do you think VGMaps has room for two more full map sets? At the very least we would get maps of that river rapids mini-game that was missing from the "16-bit" versions. I've been discussing it on TASVideos because I like to make maps to help with potential tool-assisted speedruns, but if there's enough interest, I could start a topic on Maps In Progress so we could discuss how the maps are coming together.